Hearts midfielder Arnaud Djoum is facing four to five weeks out with a medial ligament injury sustained during Saturday’s win over Hamilton. The Cameroonian was forced off at half-time after damaging his knee in a block tackle during the first half at the SuperSeal Stadium. 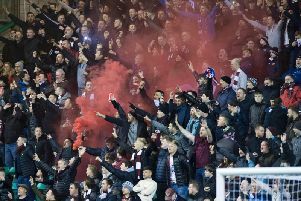 Manager Craig Levein was delighted with the 2-1 victory after his team survived relentless second-half pressure from Hamilton. However, he admitted Djoum’s injury is a blow. Hearts face away matches against Partick Thistle, Dundee and Ross County over the next few weeks before a home game against St Johnstone at Murrayfield. Levein was hugely encouraged by Saturday’s dogged defensive display as Hearts clung to their 2-1 half-time lead to see out the victory. Ross Callachan’s first goal for his new club allied to Kyle Lafferty’s penalty gave the visitors control in Lanarkshire before Rakish Bingham halved the deficit.